Simmba is a 2018 Indian Hindi-language action film directed by Rohit Shetty and written by Yunus Sajawal and Sajid-Farhad. A spin-off of the Singham franchise the film was produced by Shetty under his banner Rohit Shetty Picturez and Karan Johar, Hiroo Yash Johar and Apoorva Mehta via Dharma Productions. Reliance Entertainment also co-produced and distributed the film. It stars Ranveer Singh, Sara Ali Khan and Sonu Sood, with Ajay Devgn reprising his role of Bajirao Singham in an extended cameo role. The film follows Sangram "Simmba" Bhalerao, a corrupt police officer hailing from the same town as Singham, who is forced to lead a more righteous path after tragedy strikes those near him. Not to be confused with Simba. Some scenes from Simmba were inspired by those from the Telugu-language film Temper (2015). Its estimated production budget was ₹60 crore (US$8.3 million). Principal photography began in June 2018 with most scenes filmed in Goa and Kolhapur and the remaining filmed at Hyderabad and Mehboob Studios in Mumbai. Shooting was wrapped up by early December in the same year. The film's soundtrack was composed by Tanishk Bagchi, Lijo George - DJ Chetas and S. Thaman, with lyrics written by Shabbir Ahmed, Rashmi Virag, Kumaar and Kunaal Verma. The soundtrack features remakes of two 1996 songs: "Aankh Marey" originally from the film Tere Mere Sapne, and the qawwali song "Tere Bin" by Nusrat Fateh Ali Khan. Simmba was released in countries of the Gulf Cooperation Council on 27 December 2018. The film was released in India and other international territories on the following day; it was distributed worldwide by Reliance Entertainment. The film received mixed reviews from critics, it became Singh's highest-earning opening film as of 2018; it earned ₹237 crore nett in India on its 24th day, and went on to gross about ₹400 crore worldwide. Sangram "Simmba" Bhalerao (Ranveer Singh) is an antiheroic orphan from Shivgadh, the same town where Bajirao Singham (Ajay Devgn) was raised. He observes how policemen make money in the form of bribes, finding himself motivateds to become a police officer, and succeeds. Getting bribes from some local thieves and a jeweler, Simmba enjoys and takes full advantage of the lifestyle of a corrupt cop. He is soon transferred to Miramar police station, where he sees Shagun Sathe (Sara Ali Khan) and falls in love with her at first sight. He meets his fellow policemen and one of his juniors, Nityanand Mohile (Ashutosh Rana), who is an honest constable, hesitates to salute Simmba as he's a corrupt cop. In order to prove his worth in Miramar, he interrupts a pub party run by Durva Yashwant Ranade's (Sonu Sood) brothers, Sadashiv "Sada" Ranade and Gaurav "Giri" Ranade and demands more money from them, whilst promising that he will let them continue with their illegal activities. Durva agrees and uses Simmba to free a land from an old person Vaaman Rao, who is forced to sign the papers by Simmba. Meanwhile, Simmba develops motherly and sisterly bonds with several women and girls, one of whom happens to be Aakruti Dave, a young woman who reminds Simmba of his teacher. Aakruti files a complaint against Sadashiv and Gaurav for dealing illicit drugs in their pub and using children as peddlers. Simmba initially ignores this after being pacified by Durva, and Shagun in the meantime falls in love with him. Meanwhile, Aakruti learns about the drug racket in the club and goes there one night with Chotu, a mute boy who's her student. She videotapes by cell phone to show evidence to the police, but is caught by Sada and Giri. Chotu discreetly records Sada and Giri assaulting Aakruti and flees once both of them realize. Aakruti is brutally raped by Sada and Giri. Chotu tries to tell Akruti's friend Kavya about Akruti being in danger. Kavya whilst being chased by Durva's goons goes to Simmba to file Aakruti's missing complaint. Aakruti is found injured in hospital. Simmba tries to talk to her but she dies, leaving him devastated. Police recover the phone and the video and Durva sends his goons to get the phone from Simmba, who there and then mends his ways and fights them all. Simmba finally wears his police uniform and seeing this change in Simmba, Mohile finally salutes him and soon they arrest Sada and Giri. He apologizes to Vaaman Rao, and returns the land swindled from him. In the court, Simmba is shocked to find Aakruti's video being deleted. He beats up Durva's friend who gave a false statement in the court, leading to his suspension orders. He decides to kill Sada and Giri before he goes, and plans to show it as an encounter. He shoots them both and shows as if he killed them in a act of self-defence. A committee is set up by the court, who question Simmba's encounter. In order to achieve clarity to the situation, Home Minister Vinayak Dutta appoints a senior officer to look into and handle Aakruti's case, as well as Simmba's controversial encounter. Enraged, Durva and his goons capture Simmba. Suddenly DCP Bajirao Singham comes to his rescue and both of them beat up Durva and his men. Singham tells Simmba that he is the officer, appointed by the committee to handle his case and gives a statement that Simmba killed Sadashiv and Gaurav in an act of self-defence. He also calls Dhurva's mother and wife, who each give a statement that it was Sadashiv and Gaurav who raped Aakruti and that the brothers ran a drug racket and several other criminal activities. Singham reveals that he helped Simmba despite being against his corrupt actions, so that he could instill a fear of law in the minds of men who do not respect women. As Singham leaves Miramar Police Station, he is talking to ACP Veer Sooryavanshi (Akshay Kumar). Singham congratulates him on his new post as ATS chief, and Sooryavanshi tells him that he will meet him soon. Tusshar Kapoor in a cameo appearance in the song "Aankh Marey"
Kunal Khemu in a cameo appearance in the song "Aankh Marey"
Shreyas Talpade in a cameo appearance in the song "Aankh Marey"
Karan Johar in a cameo appearance in the song "Aankh Marey"
Some scenes from Simmba were loosely inspired by the Telugu-language film Temper (2015). Shetty said, "We wanted to take four-five scenes from Temper but... thought it's better to buy the rights". The film has an estimated production budget of ₹80 crore (US$11 million). Principal photography for Simmba began in June, 2018. It was mainly filmed in Goa and Kolhapurm, with some filming in Hyderabad and extra sequences filmed at Mehboob Studios in Mumbai. On 29 June 2018, the crew filmed the song, "Simmba Aala Re Aala Simmba Aala", at Ramoji Film City in Hyderabad. On Instagram, Singh noted the large scale of the production and said that it was the biggest song of his career. Legal issues surrounding the production of Khan's debut-film Kedarnath interfered with the production of Simmba. Khan was scheduled to shoot for both films around the same time. A lawsuit shut down the production of Kedarnath and Khan allotted the time to work on Simmba. Kedarnath's director, Abhishek Kapoor, sued Khan because his film would be delayed and it would no longer mark the debut of Khan. The two settled out of court when Khan agreed to split her time between both films. In October 2018, lead actors Singh and Khan left for Switzerland to film a song sequence for the film. By late October, the crew had returned to Mumbai to film a second song, "Aankh Marey"—a remake of a 90s classic song. Because Singh was to be married in November 2018, Shetty shot most of the major sequences before the wedding date. Only the final sequence was left to be filmed after the wedding. A double for Singh was used to complete patch work of a dhaba fight scene in Goa; various camera angles were used so that the double would resemble Singh. The film wrapped shooting in early December 2018. The songs are composed by Tanishk Bagchi, Lijo George-DJ Chetas and S. Thaman while the lyrics are written by Shabbir Ahmed, Rashmi Virag, Kumaar and Kunaal Verma. The song "Aankh Maare Ladka Aankh Maare" is a remake of the song "Aankh Maare" from the 1996 film Tere Mere Sapne, originally composed by Viju Shah, sung by Kumar Sanu and Kavita Krishnamurthy, and picturized on Arshad Warsi and Simran; Warsi makes a cameo appearance, with Sanu's voice. The song was remade for the film, with the music reproduced by Bharat Goel, Aditya Dev and Chandan Saxena. The song "Tere Bin" is a recreation of Nusrat Fateh Ali Khan's 1996 qawwali song "Tere Bin Nahin Lagda". The remake is sung by his nephew Rahat Fateh Ali Khan with Asees Kaur. Simmba was released in countries of the Gulf Cooperation Council on 27 December 2018. It was released in India and other countries on 28 December. It was shown on 4020 screens in India and 963 screens overseas, for a worldwide screen total of 4983 screens. On 6 June 2018, the producers announced the start of principal photography with a skit video featuring actors Singh and Khan, director Shetty, and producer Johar. On 1 December 2018, the producers released a new poster on Twitter, featuring Ranveer Singh's Bhalerao silhouetted in front of a police uniform, to announce the release of the film's trailer on 3 December. On 2 December, a second poster was released, depicting a uniformed and gun-wielding Bhalerao. On 3 December, the official trailer was released. On 6 December 2018, the first song from the film was released, titled "Aankh Marey," a remake of the original song from the 1996 hit film Tere Mere Sapne. It is sung by Kumar Sanu (who also sung the original with Kavita Krishnamurthy), Mika Singh, and Neha Kakkar. Actor Arshad Warsi, whose film and song debut was with the original, appeared again in the video for the Simmba remake, along with several actors from another film from director Rohit Shetty, Golmaal: Kunal Khemu, Shreyas Talpade, and Tusshar Kapoor. The release date for the remake was specifically chosen to coincide with the release date of the original 22 years earlier (6 December 1996). On 6 December 2017, Singh and the film's producers tweeted a poster of Singh as a uniformed ACP Bhalerao, wearing sunglasses and standing in an open-mouthed pose. Simmba released to "mixed to positive" reviews from critics. Ambica Schin of Khaleej Times gave the film four stars out of five and sums up, "If you are on the lookout for a totally masala, paisa vasool movie to end the year with a bang, we recommend you watch Simmba. The melodramatic, over-the-top film is sure to leave you on a high". Taran Adarsh of Bollywood Hungama declared it a "winner" with four stars out of five, writing, "Rohit borrows the essence from Temper, but modifies a major chunk of that film... What eventually unfolds on screen is so different, in a positive way". Anwesha Madhukalya of Business Today wrote, "It is indeed time to rejoice for the young star's fans for Simmba has announced the arrival of Ranveer Singh in the big league". Writing for The Times of India, Ronak Kotecha rated it three and a half stars out of five, terming the film as "a potboiler that you expect it to be, where the good surely outweighs the bad". Suparno Sarkar of International Business Times also gave it three and a half stars out of five, writing, "Simmba is a complete masala entertainer that is loaded with good dialogues, humour, heart-felt emotion and high-octane action. It lacks logic at various levels, but never ceases to entertain". A critic for The Economic Times agreed, also rating it three and a half stars out of five, but felt that "[t]he film takes a preachy turn in the second half and the narrative gets predictable". Writing for Hindustan Times, Raja Sen rated the film three stars out of five, writing, "[A]s it stands, Simmba is not only ahead of Singham, but far superior to Dabangg, the blockbuster that defines the genre". He appreciated Singh for the energy he brought to the role, but found Khan was restricted by her role. Rajeev Masand of CNN-News18 gave the film two and a half stars out of five, finding the first half to be "a sporadically enjoyable comedy", but found the second half to be "less enjoying": "The film leaves a lot to be desired, but a star is re-born". Uday Bhatia of Mint concurred with Masand: but credited Singh for playing his "cardboard creation" of a character with an "underlying sweetness that renders it more winsome than the humourless masculinity of Devgn's Singham". The box office collection figures for opening weekend of the film as presented on Bollywood Hungama are: First day It earned ₹20.72 crore nett in India which made it Singh's highest-opening film as of 2018. On second day it collected ₹23.33 crore nett and ₹31.06 crore on third day. Total first weekend nett domestic collection was ₹75.11 crore. The opening week pan-India collection was ₹ 150.81 crore, which made it a hit film. In its second week on eighth day domestic collection was ₹9.02 crore. On ninth day collection rose to ₹13.32 crore. Tenth day collection is ₹17.49 crore. Eleventh day collection is ₹6.16. Twelfth day collection is ₹6.03. Thirteen day collection is ₹5.31 and ending at 4.29 crore, taking second week collection to ₹61.62 crore. The domestic gross is ₹307.90 crore. It becomes Rohit Shetty's biggest hit as it beats lifetime business of Chennai Express. The film grossed ₹92.10 crore (US$13 million) from overseas markets as estimated by Bollywood Hungama. The gross worldwide is ₹400 crore (US$56 million). It became third highest grossing film of 2018. In 23 days of its release the domestic gross of film touched ₹300 crore mark. It took 40 days to the film to gross ₹350 crore worldwide. In Pakistan, the film has collected more than ₨ 19 crore till its fifth weekend. ↑ "'Simmba' team gets goofy on the sets – Times of India". The Times of India. Archived from the original on 26 September 2018. Retrieved 24 June 2018. ↑ "Simmba | British Board of Film Classification". www.bbfc.co.uk. Retrieved 2018-12-21. 1 2 "Simmba Box Office Collection Prediction: Ranveer Singh, Ajay Devgn set to wow you! Rohit Shetty crossover film set to bag big amount". Zee Business. 27 December 2018. Retrieved 27 December 2018. 1 2 3 "Simmba Box Office Collection till Now - Bollywood Hungama". Bollywood Hungama. Retrieved 6 February 2019. 1 2 3 4 "Simmba first look: Ranveer Singh, Rohit Shetty film reminds you of Ram Lakhan, Singham". hindustan times. 7 December 2017. Archived from the original on 3 December 2018. Retrieved 3 December 2018. 1 2 "Box Office update: Ranveer Singh fails to beat Ranbir Kapoor as the opening day of Simmba is no match to that of Sanju's | Entertainment News". www.timesnownews.com. Retrieved 2018-12-29. ↑ "Simmba box office day 3: Ranveer Singh breaks personal record, film earns Rs 100 cr worldwide". Hindustan Times. 2018-12-31. Retrieved 2018-12-31. ↑ "Does Rohit Shety love Marathi?". Times of india. ↑ "Simmba New Pics: With Ranveer Singh And Sara Ali Khan, Love Is In The Air". NDTV.com. ↑ "Akshay Kumar to have a special cameo appearance in Rohit Shetty's 'Simmba' starring Ranveer Singh - Times of India". The Times of India. ↑ "'Simmba': Ranveer Singh and Sara Ali Khan to begin shooting their first schedule set in Hyderabad – 'Simmba': All you need to know about the Ranveer Singh and Sara Ali Khan film". The Times of India. Archived from the original on 18 June 2018. Retrieved 24 June 2018. 1 2 Varma, Lipika (29 November 2018). "Ranveer Singh to shoot for Simmba after his reception". Deccan Chronicle. Archived from the original on 4 December 2018. Retrieved 9 December 2018. ↑ "Simmba: Ranveer Singh is ecstatic as he shoots for his biggest song Simmba Aala Re". PINKVILLA. Retrieved 2018-12-09. ↑ "Kedarnath: KriArj Entertainment executive alleges Abhishek Kapoor made unreasonable demands during shoot". FirstPost. 13 February 2018. Archived from the original on 16 August 2018. Retrieved 9 December 2018. ↑ "Kedarnath makers KriArj Entertainment take their tussle with director Abhishek Kapoor to court". FirstPost. 15 February 2018. Archived from the original on 19 June 2018. Retrieved 9 December 2018. ↑ Raman, Sruthi Ganapathy. "'Some stories choose you and Kedarnath was one of them': Abhishek Kapoor on the film's journey". Scroll.in. Archived from the original on 6 December 2018. Retrieved 6 December 2018. 1 2 "Simmba: Ranveer Singh and Sara Ali Khan head to Switzerland". PINKVILLA. Archived from the original on 18 November 2018. Retrieved 9 December 2018. ↑ "Sara Ali Khan and Ranveer Singh Shoot a Dance Number for Simmba – View Pics". Latestly. 30 October 2018. Retrieved 9 December 2018. 1 2 "It's a wrap for Ranveer Singh-starrer 'Simmba' - Times of India". The Times of India. Archived from the original on 8 December 2018. Retrieved 9 December 2018. ↑ "Simmba - Original Motion Picture Soundtrack". Saavn. ↑ "Simmba Aankh Marey Song: Ranveer Singh And Sara Ali Khan Burn The Dance Floor". Mid-day. Archived from the original on 6 December 2018. ↑ "Ranveer Singh and Sara Ali Khan. Tanishq Bagchi recreate "Ladka Aankh Maare" for Simmba". Mumbai Mirror. Archived from the original on 23 August 2018. Retrieved 22 August 2018. ↑ "Simmba song Tere Bin: Check out the recreated version of the classic Nusrat Fateh Ali Khan track ft. Ranveer Singh and Sara Ali Khan". Times Now. 14 December 2018. ↑ "Simmba movie meta review UAE: Ranveer Singh starrer is predictable but entertaining, say critics - Bollywood News". www.timesnownews.com. ↑ "Simmba Box Office Collection day 1: Trade analyst made this big prediction for Ranveer Singh film". Zee Business. 2018-12-28. Retrieved 2018-12-28. ↑ "Simmba: Ranveer Singh, Sara Ali Khan Are All Set. Glimpses Of Day 1". NDTV.com. Archived from the original on 4 October 2018. Retrieved 3 December 2018. ↑ "Make way for the dynamite: Countdown for Ranveer Singh's Simmba trailer begins - check out the new poster Bollywood News". Archived from the original on 3 December 2018. Retrieved 3 December 2018. ↑ "Before Simmba trailer, here are all the posters of Ranveer Singh film". hindustan times. 3 December 2018. Archived from the original on 3 December 2018. Retrieved 3 December 2018. ↑ "Simmba trailer: Get ready for a Ranveer Singh explosion as Rohit Shetty's all set to end the year with a blast Bollywood News". Archived from the original on 3 December 2018. Retrieved 3 December 2018. 1 2 "Simmba song Aankh Marey releases today on December 6 - here's why this date has a special significance Bollywood News". www.timesnownews.com. Archived from the original on 6 December 2018. Retrieved 6 December 2018. ↑ Sachin, Ambica (27 December 2018). "'Simmba' movie review: Ranveer dominates in this masala flick". Khaleej Times. Retrieved 28 December 2018. 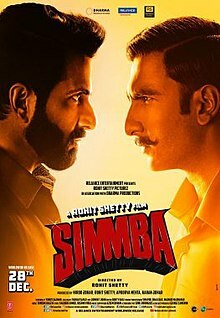 ↑ "Simmba Movie Review". Bollywood Hungama. 28 December 2018. ↑ "Simmba Movie Review: Ranveer Singh shines in this repackaging of an 80s movie". www.businesstoday.in. ↑ Kotecha, Ronak (27 December 2018). "SIMMBA MOVIE REVIEW". Times of India. Retrieved 28 December 2018. ↑ Sarkar, Suparno (28 December 2018). "Simmba movie review: Typical Rohit Shetty film but never ceases to entertain". International Business Times, India Edition. ↑ "'Simmba' review: Ranveer Singh makes it worth the watch". 31 December 2018 – via The Economic Times. ↑ "Simmba movie review: Ranveer Singh and Rohit Shetty create an angry cop movie universe". Hindustan Times. 28 December 2018. Retrieved 1 February 2019. ↑ "Simmba Movie Review: Rohit Shetty Film Leaves a Lot to be Desired, But a Star is Re-born". News18. ↑ Bhatia, Uday (28 December 2018). "'Simmba' movie review: Crash and Burn". Live mint. Retrieved 1 February 2019. ↑ "Simmba Box Office Collection Day 1: Film Emerges As Ranveer Singh's Highest Opener Till Date, Earns Over Rs 20 Crore". NDTV.com. Retrieved 2018-12-29. ↑ Taran Adarsh [@taran_adarsh] (4 January 2019). "#Simmba roars and scores at the BO... Crosses ₹ 150 cr mark in Week 1... Glowing word of mouth has converted into footfalls... Fri 20.72 cr, Sat 23.33 cr, Sun 31.06 cr, Mon 21.24 cr, Tue 28.19 cr, Wed 14.49 cr, Thu 11.78 cr. Total: ₹ 150.81 cr. India biz. SUPER HIT.r]" (Tweet) – via Twitter. ↑ "Simmba is Rohit Shetty's biggest hit, Ranveer Singh film beats lifetime business of Chennai Express". Hindustan Times. Retrieved 2019-01-16. ↑ Ali Zain (29 January 2019). "SIMMBA NEARING THE 20 CRORE MARK AT PAKISTAN'S BOX OFFICE!". EntertainmentPK.com. Retrieved 29 January 2019.